Azamara Club Cruises is offering a $500 shipboard credit per stateroom on 11 Europe voyages booked from Feb. 13 to 17. The promotion also gives those book complimentary chocolate-covered strawberries and dinner for two in either Prime C or Aqualina specialty restaurants. 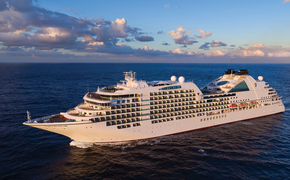 In addition, the company is offering $500 ChoiceAir credit per guest, up to two guests, for Europe voyages, when booking an ocean view, veranda or Club Ocean Suite. The air credit increases to $1,000 per guest, up to two guests, in the Club Continent and Club World Owner Suites. This combinable offer applies to new individual bookings made with deposit through March 31. Furthermore, travelers receive double ChoiceAir credits on Azamara Quest’s April 4 voyage from Nice, France. Among the 11 European voyages eligible are 11- and 12-night voyages aboard Azamara Journey to the Spanish and French rivieras, departing Aug. 9 and Aug. 20. Also eligible are four Eastern Mediterranean voyages, ranging from 11 to 14 nights, departing Oct. 15, Oct. 26, Nov. 5 and Nov. 15 aboard Azamara Journey -- the last sailing takes guests on to India and the Maldives. Also eligible are 10- and 11-night Mediterranean voyages aboard Azamara Quest -- the Greek Isles departing on Aug. 1, and the Italian, French and Spanish rivieras on the Oct. 6 and Oct. 16 sailings. Travelers also can choose a 12-night trans-Atlantic voyage departing from Seville, Spain, on Nov. 7.